House with 3 bedrooms, 2 bathrooms. Living room with a kitchen and views of the mountains. House situated in the countryside, very quiet place. Free pool. Careful and modern decor. Recent construction 2012. The house is fully equipped. Discount for length of stay. Near Vila Nova de Cerveira 5 Km (Land of Fine Arts - Biennial) and Valencia 8 km. Near the Rio Minho (1 km), allowing excellent walks. It is 5 km from the bridge over the River Minho allowing you to visit neighboring Spain and why not 'lunch / dinner the excellent Spanish tapas'. 8 Km Valenca do Minho have known for its fortress, directed to those who like the local trade, as the fortress is full of shops, great place to shop. The house has its own well water serving for consumption (analyzed 6 in 6 months). Casa agradável, tal como se vê nas fotos. Local super tranquilo para descansar tal como pretendíamos. As camas faziam muito barulho. Na 2ª noite tivemos que as arranjar para conseguirmos dormir um pouco melhor. Falta de papel no wc, detergente na cozinha. Deviam ter mais atenção. Sao pequenos pormenores que devem constar, pelo menos para o dia da chegada, pois não sabemos o que levar. A piscina é partilhada tal como nos informaram mas agradável e grande. Só tem o inconveniente de termos de que passar por um trilho em terra para la chegarmos e partilhar a mesma com os familiares dos proprietários. Localiza-se a cerca de 100 mts da casa. No dia da chegada fomos recebidos de forma estranha. Tirando pormenores, que tenho que mencionar, pois comparo com outros locais onde já estive, a casa é muito boa e maior do que aparentam as fotos. Agradeço à Liliana e aos seus pais D. GRaça e Sr. LUis pelo acolhimento. Casa com condições muito boas: cozinha equipada, espaço para crianças, adaptado com brinquedos, cantinho de leitura e uma variedade de livros à escolha. Ideal para familia com crianças e não só. Local muito calmo e ao mesmo tempo perto de tudo. VIla nova de Cerveira, Espanha, Valença Caminha, Vigo, Tui. PIscina muito agradável. Tudo limpo e muito pratico. Excelente semana! La casa es tal y como aparece en las fotos, es más tanto las habitaciones como la cocina y el salón son mas amplios. En el salón hay un pequeño apartado con un espacio para que los niños jueguen, mesa, sillas, algunos cuentos y juguetes. Aunque en las fotos no se ve, hay mesa y sillas para poder comer fuera. Sitio suficiente para aparcar los coches. Lo cierto es que hemos quedado muy contentos con nuestra estancia. Por poner un pequeño inconveniente, dos de las camas hacían bastante ruido. El pueblo es muy tranquilo, y los pueblos de alrededor son muy bonitos, así como las playas. Nos encantó la zona. Liliana y su familia son muy agradables y han estado pendientes de que no nos faltase nada. Gracias!! Recanto ideal para famílias com filhos, onde se pode conjugar campo, praia, piscina e visita às vilas e aldeias do Alto Minho. Muito bem localizado entre Vila Nova de Cerveira e Valença, com bons acessos às praias de Espanha em particular de La Guardia. Casa muito bem decorada e com todas as comodidades. 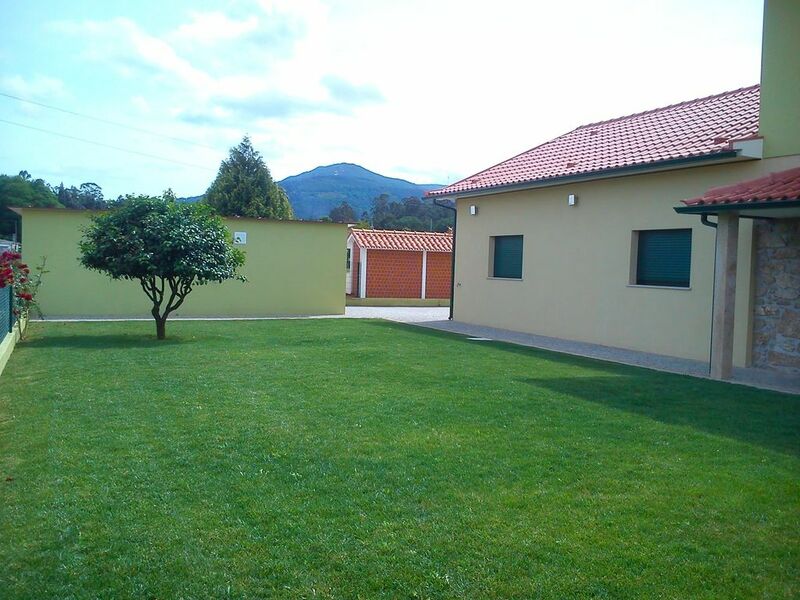 Proprietária especialmente atenciosa à decoração da habitação e comodidades disponíveis. The house is about 40 Kms from Vigo airport and about 100 kms from Porto airport (Francisco Sá Carneiro). The Vigo airport should take the highway E-1 / AP-9. When crossing the border continue on Auto - Highway A3 to Exit 14 to Interstate Highway 13, toward Vila Nova de Cerveira / Viana Castle. Spend 3 roundabouts straight ahead. About 1km after the third roundabout, turn right on S. Street Sebastian toward Cork oak, going through a small cross located on your right, go forward about 50 meters, turn right after 25 meters turn again to the right, about 500 meters from the house appears on the right side of yellow, stone walls, green gates. Recommended restaurant 5 km in the center of Vila Nova de Cerveira (House Swallows, Lau House among others). Weekly market held every Saturday in Vila Nova de Cerveira which hosts many tourists, considered one of the best fairs to national level. Slow river beach, watched, with beautiful green spaces for unique moments of rest. In Aquamuseum in Vila Nova de Cerveira is recreated all the way from the Minho river, its species (40 are represented alive and so many dead), traditions and activities associated with it. The Aquamuseum is one of the most attractive points of the village, is situated along the Rio Minho, in Little Castle Park where you can enjoy a number of outdoor activities, it is equipped with playground and mini golf, playground and water park and even equipment for physical exercise. Land famous for Modern Art Biennale, the oldest in the country, is an event aimed at promoting contemporary art, supported by a renown national and international reputation built over 30 years. The event combines art in its various expressions to a territorial space characterized by its quality of life. In addition, there are several art galleries, it is concluded that Cerveira is the "Village of the Arts" and must for lovers of modern art. And because this is a friendly village, you will like for sure, it is best to come with time. Paredes de Coura is very near here, Vilar de Moors as well. With a bit of luck even catch the famous festivals.